Magnalox is one of my favorite GPS visualization tools on the market. As mentioned recently, Magnalox provides both free and premium services to allow you to load, analyze, visualize, and share information you've collected by GPS and supports more methods for visualizing the data than any other tool I've seen. This past week Magnalox announced a new service allowing you to produce live tracking which can be viewed in Magnalox and, more importantly, with Google Earth. 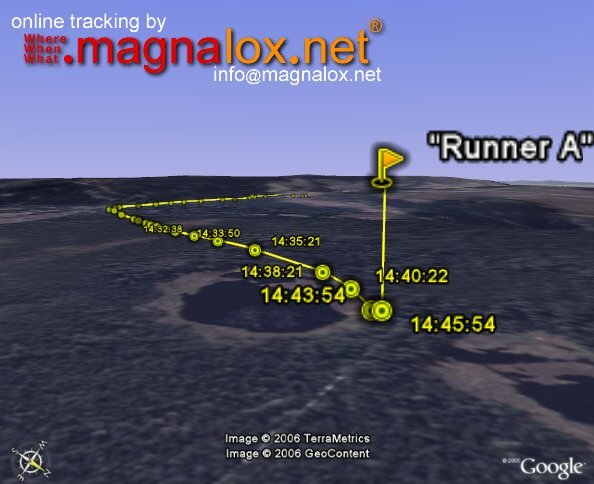 You can use a variety of methods to track and connect to Magnalox for the live tracking. It uses an efficient software package designed to run on many PDAs, and requires a GPS capability and some sort of communication method. It's possible to use this tool world-wide and combinations include: A fully integrated PDA phone with GPS, a PDA-GPS-Phone, Bluetooth GPS-PDAPhone, etc. The system can still upload an archived copy of the track if live communications aren't possible. 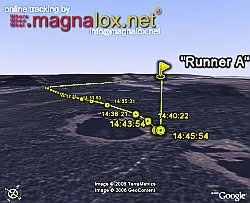 Here is a simulation of how a live track would work in Google Earth. For a limited time the live tracking software and service are availble for free. More details available in the announcement.